You’ve finished your re-direct examination, and the witness is stepping down from the witness stand to walk out of the courtroom. Then the judge turns to you and says, "Call your next witness." Your stomach tightens and your palms start to sweat as you realize: You don’t have anyone waiting in the hall. Maybe your witness’s testimony went faster than expected, maybe your opponent did a lousy job of cross-examination, or maybe your next witness got caught in traffic. But whatever the reason, it doesn’t matter. 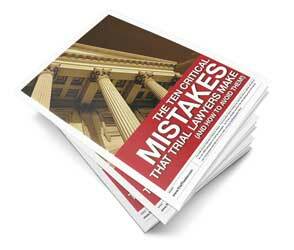 You’re stuck without a witness, your judge is getting impatient, and you need a solution. Like they said in the movie Speed: "Pop quiz, hot shot. What do you do? What do you do?" 1. Avoid the situation if you can. First, and most importantly, let’s try to avoid the situation. It begins by telling your witnesses to get to the courthouse early and ensuring that your witnesses are there well before they’re actually scheduled to testify. If you want your witnesses to get to the courthouse on time, you’ll need some help from your support staff. Make sure that each witness receives written directions on how to get to the courthouse, where to park, and what they should (and shouldn’t) bring with them. Get them to program your office’s phone number into their cell phones and make sure that you’ve got someone in your office who will answer the phone (no voicemail!) all day long. Your office person needs to be able to give directions, so make sure that they know how to use Google Maps or whatever online mapping program you prefer, so they can give your witness accurate directions. This coordinator will also want to get cell phone numbers, text message numbers, office numbers, and email addresses for each witness, so they can reach everyone 24 hours a day during the length of your trial. It may sound like overkill, but you can be assured that you’ll be kicking yourself if you don’t know how to reach a witness in the middle of your next trial. 2. Have a filler witness ready to go. Maybe you only need 30 min to fill, so have someone on standby. I’m not advocating having all of your witnesses sitting in the hallway throughout the length of your trial, because that’s a colossal waste of time. However, it’s better to waste an hour of the witness’s time than even 10 seconds of the jury’s time, so plan to overlap your witnesses and tell them to come early and prepare to wait. Even if it’s the CEO of the company, he should be prepared to get there early and wait to be called. "But I’m the CEO and I’m too important to waste time here at the courthouse." "Oh, I’m sorry, I thought you wanted us to win this case. If so, then you’ll need to give me what I need. In this case, that means I need you waiting outside the courtroom so that you can testify as soon as you’re called." Early in my career, I tried to be nice and space out the witnesses to respect their time as much as possible and minimize how much time they wasted in the courthouse, but then I realized it’s safer to waste a little bit of their time than to face an empty chair in the courtroom. I still try to respect their time as much as possible, but now I tell them to bring a book and be prepared to wait. As a side tip, you might want to put a few crossword or Soduko books in your briefcase, or a non-descript book that includes tips for testifying ("Sit up straight; Look at the jury; Tell the truth, even if you think it hurts the case") to help minimize their pain of waiting. 3. Take the heat. Let’s assume that you didn’t follow steps 1 or 2 before the trial, and now you’re facing an empty chair. What can you do? Don’t try to dance around and shift the blame to your witness. You’re in control of the trial, so if the witness isn’t there on time, it’s your fault, not the witness’s. You need to fall on the sword and tell the judge why you’re not prepared. Your judge probably doesn’t care why there’s no one in the witness stand, all she cares about is that you’re wasting her time and the jury’s time. Rather than focusing on why the witness isn’t there, the important question you need to address is, "How long until the situation is fixed?" Hopefully, you know how long it will take your witness to get to the courtroom (always remembering to factor in time for parking, metal detectors, and elevators), so you can candidly tell the judge how much longer it will be until you can put a witness in the witness stand. If it’s only going to be 5 or 10 minutes, the judge may be accomodating. If it’s going to be 30 or 40 minutes, you should be prepared for a tongue lashing. Whatever the reason, accept responsibility and be prepared to take the heat. 4. Ask for a break. Once you’ve accepted responsibility and told the judge how much more time you need, you need to figure out what to do in the meantime. The easiest thing to do, especially if you only need 10-15 minutes, is to ask for a break. If your jurors smoke or have weak bladders, they’ll appreciate the opportunity to stand up, stretch their legs, and go take care of their business, but don’t make a regular habit of asking for breaks. Your jurors are taking time out of their lives to come decide your case, and they don’t want to waste it wandering around the courthouse while you try to get your case together. 5. Work on the jury instructions. Maybe the judge isn’t inclined to take a break merely for the sake of taking a break, so you’ll need to find a more valuable way to fill the time. One good way to make use of the empty time is to finalize your jury instructions. Jury instructions always need to be tweaked before they can be read to the jury, so use this time to finalize the instructions. This still has the (huge) disadvantage of wasting the jury’s time, but at least you make use of the valuable court time. 6. Read stipulations. One of the best ways you can use this downtime is by introducing stipulations into evidence. Now is a great time to read the agreements that you’ve made with opposing counsel, or to introduce the photos that both parties have stipulated into evidence. Ideally, you want to introduce those stipulations at their most opportune time, but since desperate times call for desperate measures, now might be the best time to introduce them into evidence. 7. Settle the case. This is the last suggestion, because it’s the worst. But let’s face it — you don’t have a witness, how good can your case be? Now might be the time for you to strike a deal, before your case completely falls apart. Obviously, you want to avoid having an empty witness stand, but sometimes, you simply can’t avoid it. Hopefully these tips will help ensure that you always have a witness present, but in case you don’t, at least you’ll be able to minimize the damage. Good luck in trial! Just wanted to let you that I really enjoy reading the article I get every week in my email. I always learn something from your writings and they are just fun to read. What is interesting (and why I am writing this email) is that I am not a Lawyer. But I feel that the “layman” can really get allot from the information you provide. It would be interesting to know how many of your subscribers are non-attorneys like me. Keep up the good work.